The guys were at the marina before I arrived ready to go. 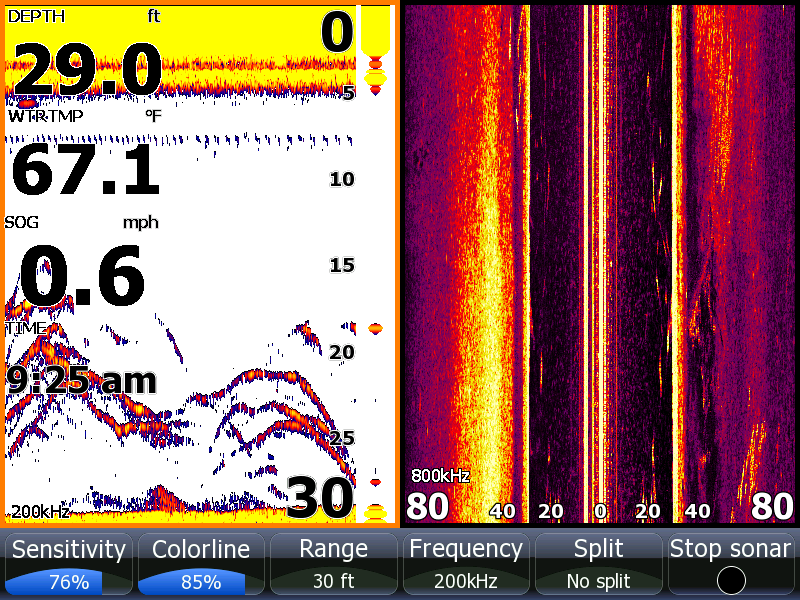 We took off, caught a tank full of bait in 5 casts then went to an area to pull boards. I set out a spread of boards pulling very shallow water. Within the first 20 minutes we took 8 hits and hooked up with 6 but only managed to get 1 of the 6 into the boat. At this point I did not like the ratio so I decide to do something completely different. I made a move about 7:30 to 30 to 40 foot flats and pulled boards and downlines. We first hooked up with the boards then everything we had out got hooked up. Must have been pretty funny for someone to see 4 grown men running around the boat! The board fish would hook up and swim to the other side of the boat, the downline fish would swim under the boat, but it didn't matter much. 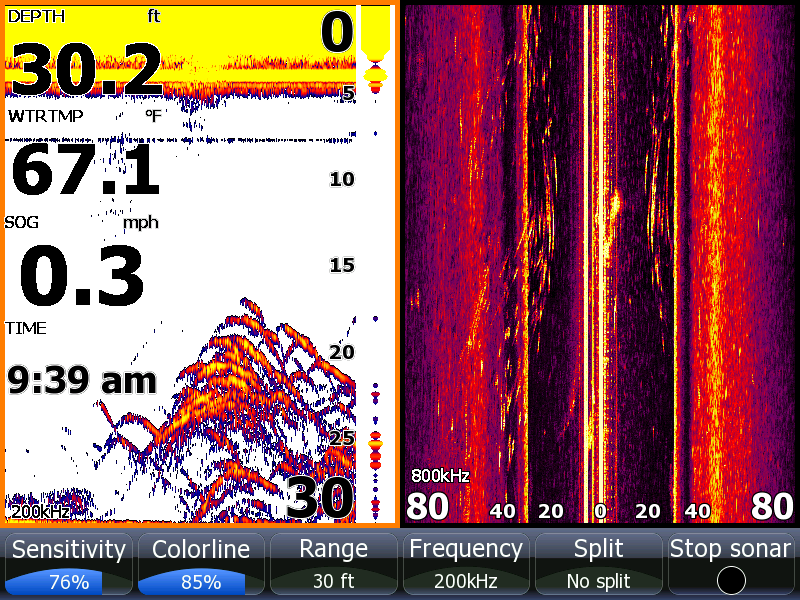 With 15 rods hooked up the odds were in our favor to have fun. At one time I had a fish in the net that had swam around another line and while I was trying to free it Josh had a fish on a board freight training him around 5 other rods. By the time he got back to the back of the boat following the fish he had a line tied around his legs and had pinned me into the corner. I had to get out because Wilmer and Jan had fish I had to net for them. Quite an eventful moment. I pulled off of these fish to get a chance to breath and straighten thing out and popped these pictures of some other fish in the area. We had emptied the bait tank, were out of bait and full of fish.The sweet thing about the action this morning was that there were no boats around, we were in the fog and the fish nor other boaters did not know we were there. The guys took home 16 very nice Stripers that weighed in excess of 100 pounds. Sunny and Pleasant, Water Temperature 67* and Clear. I met the guys at High Point at 6am then went and caught bait. It being the weekend I knew there would be a lot of boat traffic so I decided to start off fishing deep with downlines instead of pulling boards and getting them cut off by bass boaters racing up the lake. That was probably the best decision I made today, 5 minutes after I set up you could hear the roar of motors a mile away running uplake to get to their fishing holes. 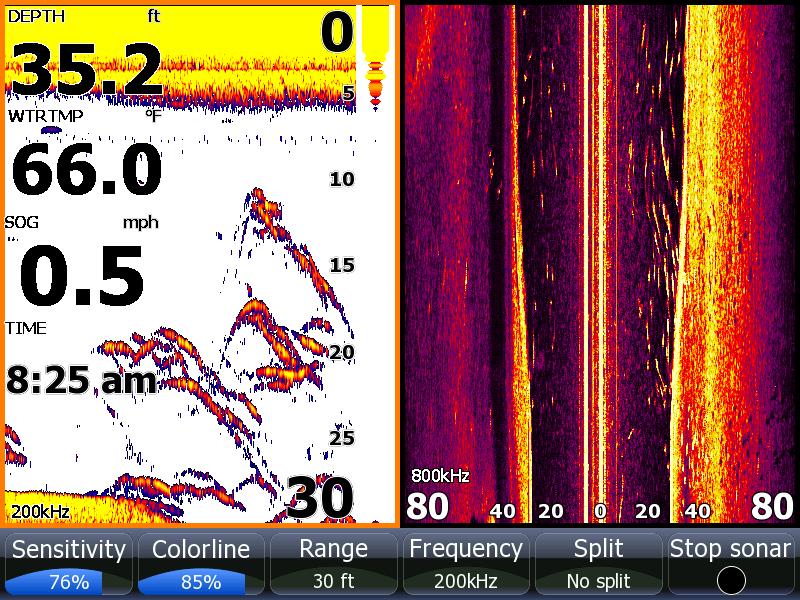 We worked deeper flats catching a fish here or there but the fish were not real aggressive this morning. I found numerous schools but mostly small schools of 50 to 100 fish. We ran out of bait around 10 and had to go catch more. After catching bait we set up on some different structures and took plenty of hits but our landing ratio was not the best. Today we had 33 hookups, caught 13 Stripers and a couple of Kitties. The guys took home a dozen fish to cook out at Kevin's tonight. We have to thank Neal for most of the fish, he had a unique way of calling the fish to the boat. He would fill his bladder up with beer then have to empty it, and every time he pulled the snake out the rods would double over. I met the guys about 6 this morning, went and made about 6 casts with the throw net and filled up my bait tank. I set out a spread of Water Bugz before light pulling a very shallow flat. I started getting nervous baits right away but we did not take a hit for about 200 yards. We hooked up and landed the fish then about every 10 minutes or so we would hook up again. The fish were not feeding well but we had steady action. After about an hour we had 4 or 5 fish in the box but I thought we could do better so I moved to pull even a shallower flat. We worked it for about 10 minutes then Juan noticed a spray about 80 yards from us so I headed that direction and we popped a nice Striper on a Pencil Popper. 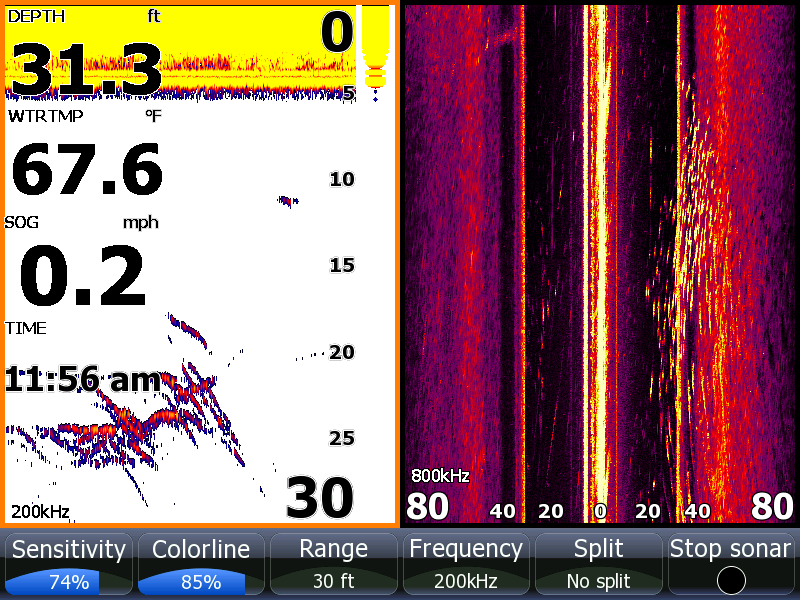 I went right over the school of maybe a thousand fish and only had 1 hit. The fish simply were not hungry! 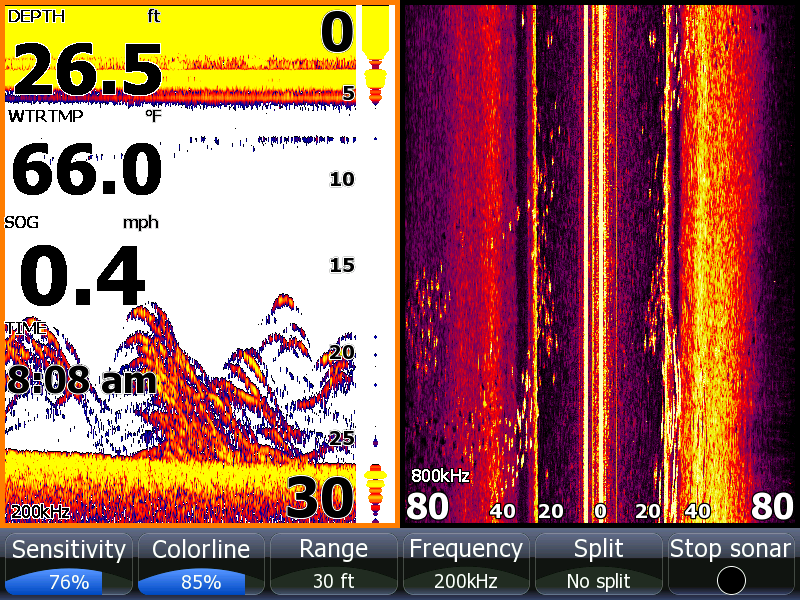 We worked the area for the next couple hours going over fish only to hook up about once every 15 minutes. I had 10 boards, a bobber and 7 downlines out and the fish were simply lethargic. After using up 60 baits I decided to go catch some more bait and try a different area. 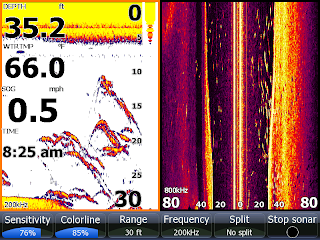 That turned out to be a productive move, we caught fish on both boards and downlines but only about 4 fish an hour. 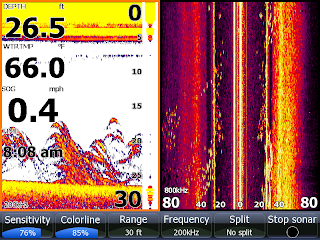 I popped a couple pictures of my Lowrance when we would hook up with fish. The guys had a great time today, we only landed about half our fish that hit but we ended up catching 18 Stripers and 4 Catfish. The guys took home 16 Stripers. I picked the guys up at 5:45 and went to catch bait. Five throws later we had a tank overflowing with beautiful baits. It was still 20 minutes before daylight so I decided to do something crazy. I decided to pull boards right up on the bank in water 5 foot or less and once my outer board got close to the bank it went off. Anthony hopped on it and wrestled it in. By the time I got the fish off the hook another rod went off then another. 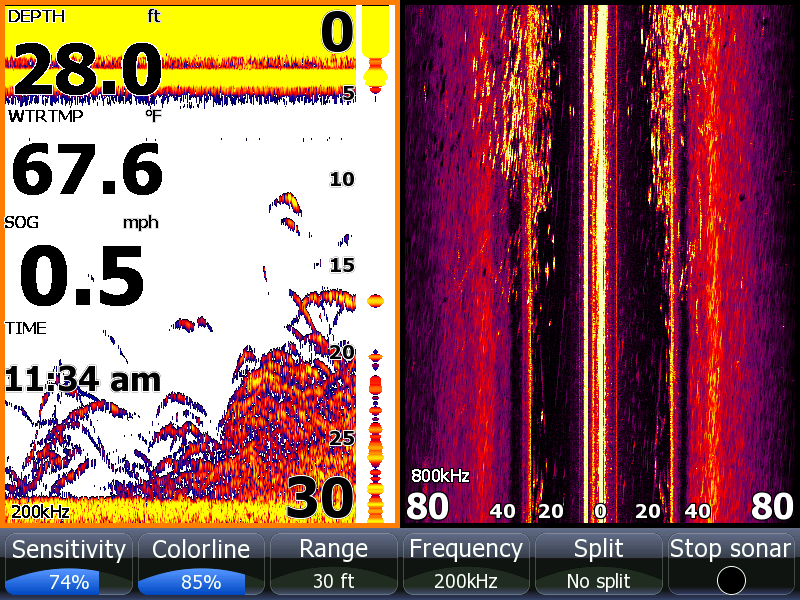 Within 5 minutes we had hooked up every rod on the left side of the boat then the other side started going off. We had numerous doubles and one triple hooked up at once. By 7:15 everything we had out had been hit and the guys incredibly landed every fish, 11 fish were in the box. Well that crazy move had paid off so I decided to head back downlake to do something different. I set up on the inside edge of a flat and pulled it for 400 yards only to catch a Catfish. For a second I was wondering if I should have not left the fish we caught earlier so quickly. 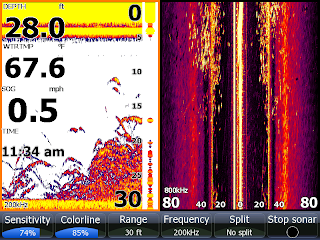 I really was not worried, I had confidence in myself and my Lowrance. 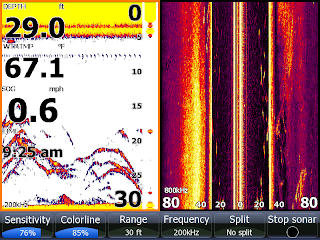 About 8:30 I started seeing some downline fish and by 9 we were regularly seeing schools and catching Stripers out of all of them. 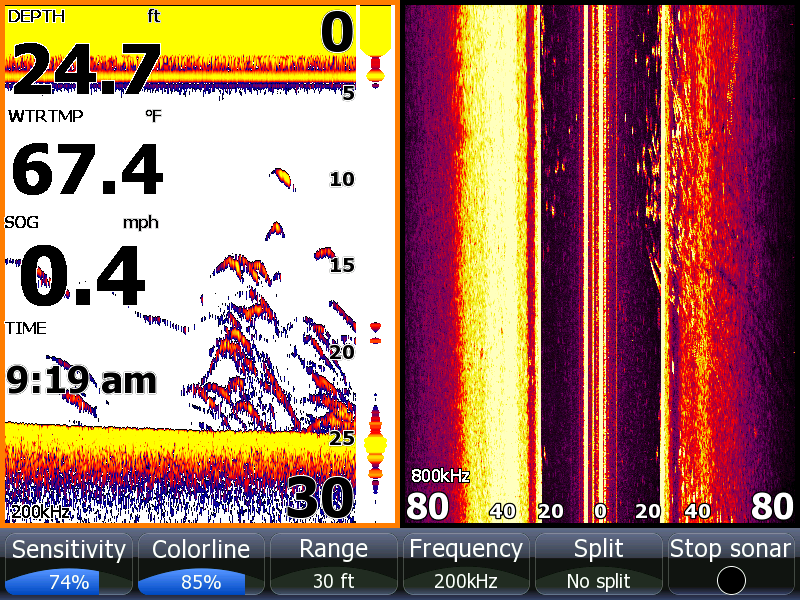 The top picture of my graph show us just entering into a school of catchable Stripers. 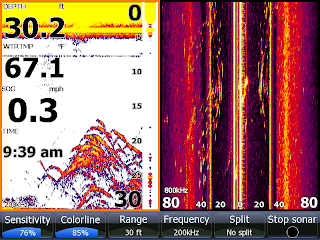 The middle picture is us coming into the "Mother Load" of fish and the bottom picture of my Lowrance shows us going over 10 or 12 Stripers and 30 to 40 others out to the right side of my boat about 40 feet. Needless to say we caught a whole bunch of fish today. Sunny, Windy and Pleasant, Water Temperature 76* and Clear. Today we celebrated the Cralle annual vacation by fishing for Stripers. We were scheduled to go out tomorrow but the weather is supposed to crash tonight so we changed our plans and went today. I advised Maury yesterday on the phone that this being the only nice day of a holiday weekend the lake would be busy with bass boats and that once the boats got out fishing would slow down. I usually take 6 people out for a few hours then drop them off and pick up another boat load, take them out for a few hours then do it again. Maury knew the first flight would be the most productive so he sent the kids out to have some fun early. We set out a bunch of boards and started hooking up immediately. The 2 girls jumped on the rods and the battle began, and what a battle it was. After a couple of minutes they wrestled their fish to the boat and we boated both of them. While we were netting the fish another hooked up and Gus grabbed the rod and boated it as well. 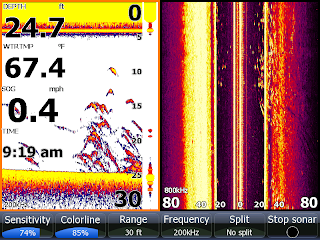 Fish were breaking all around us and we were in the hot spot. Well, we were in the spot but after 4 boaters ran over us the fish spooked and all we could do was dream of what we could have caught there if only a few boaters would have had the courtesy to not run over top of us. That's fishing on the weekend! Well we fished for a couple more hours and boated a few more fish then caught bait and picked up the B team. We fished for a couple hours only to boat 1 more Striper. Maury was summoned to return to the house so we went back, took pictures and took the third group of people out but as I was leaving the dock the wind changed direction, picked up speed to about 25 mph, and the temperature started dropping. We fished for about an hour going over nice schools of fish without even getting a strike. It would have been nice to catch some more fish today but everyone seemed to be happy being together enjoying the day as well as the company. It is a blessing for me to see and be a part of a family tradition where a family gets together and bonds like the Cralle's do. Thankfully Gus [the guy on the left, who is available girls] returned from his second deployment with the Marines unharmed and well.